The New York Times checked in yesterday with a piece on the NYC condo market... while the market for $100 million mansions in high rises along 57th Street may have vanished, "sales at the other end of the new development market have been brisk." Prominently mentioned in the article is Steiner East Village, developer Douglas Steiner's condoplex rising on Avenue A at 12th Street. Not exactly giving it away here. The 7-story, 82-unit building officially at 438 E. 12th St. features homes starting at $1.1 million... with the 4-bedroom penthouse with 1,364 square feet of terraces that's asking $11.25 million. 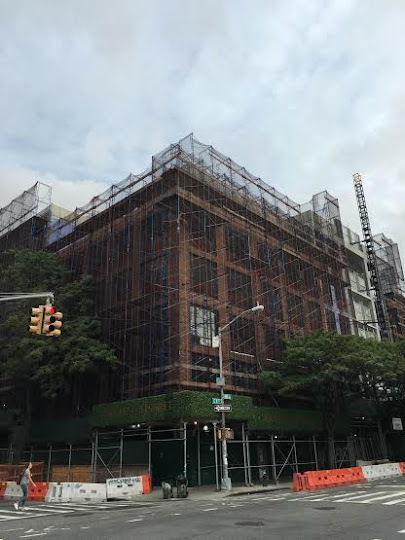 [W]hile prices in the building, which average $2,100 a square foot, are hardly a bargain in the East Village, which has very little new development, they can seem inviting compared with other downtown neighborhoods. [Broker Fredrik] Eklund said the building has drawn a number of buyers from the West Village and TriBeCa, some of the most expensive areas in the city, where inventory under $5 million is hard to come by. “I think we’re setting a new high market for condos in the East Village, but compared to the rest of downtown, people understand that they’re getting a value for Manhattan,” said Douglas C. Steiner, the chairman of Steiner NYC. Amenities in Stei Town include a 24-hour lobby concierge, 50-foot long pool, spa, gym, library, playroom, parking and, in some cases, views of a 7-Eleven. I can't wait to get a look at the people who live in this building. A question: Do you think they will shop at the 7-11 or the NY Grill & Deli? So many choices for them! Wanker naming the building after himself. He's the wallet and nothing more. Credit to the architects and producers of beautiful materials used. It has been rising pretty quickly its nice to note red brick dominates the facade as opposed to panels of glass. Remembering what it replaced a asphalt field used weekends as a flea market for peddlers selling the unwanted stuff from a garage or attic, a Rectory that was dilapidated, a Catholic school shuttered no students in uniforms and Nuns with wooden rulers and a church rarely having a audience other the old widows and their prayer beads. The Diocese filled its poor box and received a good sum for the property money they needed as the attending flock grows smaller. Now it is re purposed the builder see's a healthy condo market foregoes the rental and decides the tax credits for affordable are not needed, fair enough. People will buy the units and where they chose to shop is their business. There will be individual choices and taste. Put out the welcome mat they are not Aliens needing to be looked at they are people who selected this neighborhood to live in and make a life that's all.